In 2013, the American Littoral Society (ALS), along with its partners the Borough of Bradley Beach, Rutgers Cooperative Extension, Monmouth County Department of Public Works and Engineering and more, started building the Bradley Beach Maritime Forest. By planting this forest, ALS hopes to improve storm protection, reduce flooding, improve water quality, increase habitat for shorebirds and other species along Fletcher Lake in Bradley Beach, and offer an outlet for environmental education. In 2014, the project was awarded a Monmouth County Planning Merit Award. What was once a vacant lot is now a well-established forest of grasses, shrubs and trees and habitat for birds and small mammals. This fall, work continued at the maritime forest. 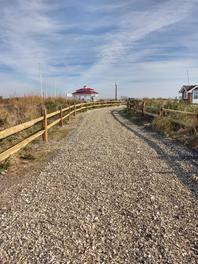 Clam shells were added to the pathway, a split rail fence was installed along with two gates, and more than 200 native plants were added to enhance the site. This spring ALS plans to install three educational sign posts along the trails. NJDEP published a proposal in the NJ Register changing or adding definitions, and modifing other provisions in the Stormwater Management Rules. NJDEP is proposing to replace the current requirement that major developments incorporate nonstructural stormwater management strategies to the "maximum extent practicable" to meet standards for groundwater recharge, stormwater runoff quantity and stormwater runoff quality, with a requirement that green infrastructure be utilized; clarify and modify the definition of major development; make changes to apply the total suspended solids (TSS) removal requirement to the runoff from motor vehicle surfaces and to remove the TSS requirement as it applies to runoff from other impervious surfaces not traveled by automobiles, such as rooftops and sidewalks; and make changes to support water quality and stormwater management improvements in communities with combined sewer overflows. The proposal also includes amendments to provisions in the Coastal Zone Management Rules, the Freshwater Wetlands Protection Act Rules, the Flood Hazard Area Control Act Rules, the New Jersey Pollutant Discharge Elimination System rules. A public hearing is scheduled for Jan. 8, at 1 p.m. at the NJDEP 1st floor Public Hearing Room, 401 East State Street Trenton. Comments may be submitted electronically or mailed by Feb. 3. Click here for the mailing address. New Jersey Future released its Green Infrastructure Municipal Toolkit. The online toolkit offers a variety of tools designed to help municipalities plan, implement, and sustain green infrastructure in public and private sector development projects. Users can access direct guidance on identifying stormwater issues, modifying master plan policies and zoning regulations, and coordinating with Sustainable Jersey actions for certification. Resources also include case studies, a grant finder, information on plants and soil and more. 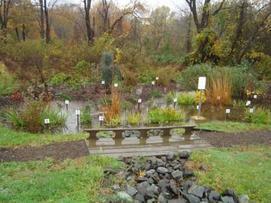 Click to access the New Jersey Future Green Infrastructure Toolkit. On Nov. 20, The Village of Loch Arbour amended an ordinance allowing flexibility in driveway design. Under the ordinance, driveways constructed of a pervious pavement may exceed the impervious or building coverage by 10% of the lot area, not to exceed 500 sq. feet, whichever is less. The ordinance also sets a standard for the construction of pervious driveways. Sustainable Jersey is offering a variety of opportunities including grants cycles, webinars and trainings for participating municipalities and schools. Click here to access a list of all upcoming Sustainable Jersey events. Sustainable Jersey is partnering with PSEG for two grant cycles. The municipal cycle will award four $20,000, eight $10,000, and twenty $2,000 grants to support efforts related to Sustainable Jersey Actions. The application deadline is Feb. 15, 2019. Click here for more information on the municipal grants. The school cycle will award four $10,000 grants and thirty $2,000 grants to support efforts related to Sustainable Jersey for Schools actions. The application deadline is Mar. 15, 2019. Click here for more school grant information . 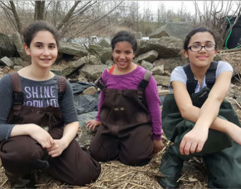 Applications are now being accepted for the 2019 President's Environmental Youth Award (PEYA). Since 1971, the President of the United States and the EPA have recognized outstanding environmental projects completed by K-12 youth. In each EPA region one award will be presented to applicants from grades K-5 and grades 6-12. Winners will receive a Presidential plaque and a regional certificate special recognition. Previous Winning projects have covered a wide range of subject areas, including: native habitat restoration, recycling programs, construction of nature preserves, tree plantings, renewable energy and environmental education and outreach, Applications are due by Feb. 17, 2019. Click here to learn more about PEYA and to access the application. Last January, Governor Murphy signed Executive Order No. 8 which sets a goal for NJ to reach 3,500 megawatts of offshore wind energy generation by the year 2030. Executive order No. 8 orders and directs the President of the Board of Public (BPU), with the assistance of the NJDEP Commissioner, to develop an Offshore Wind Strategic Plan. Currently the BPU is working on the Offshore Wind Strategic Plan. The BPU scheduled three public stakeholder meetings across north, central, and south NJ in December. The BPU also approved an order opening an application window for 1,100 megawatts of offshore wind capacity. The BPU’s action will allow developers seeking to build offshore wind facilities in federal waters to submit applications for approval. The application window began on September 20, 2018 and closes on December 28, 2018. The Board intends to act on the applications by July 1, 2019. Left: Sledding at Holmdel Park. Source: Monmouth County Parks System. The Monmouth County Parks System (MCPS) offers a variety of winter activities. On a safe snowy day experience cross country skiing, snowshoeing, sledding, ice skating and ice fishing at select Monmouth County Parks. Visit the MCPS Winter Activity webpage for updates on all winter activities this season. 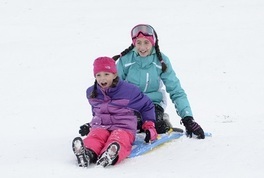 Enjoy sledding at Holmdel Park. When conditions are safe, park hours are expanded to 8 a.m.-7 p.m. Sunday through Thursday and 8 a.m.-9 p.m. Friday and Saturday unless otherwise stated on the MCPS Winter Activity page. At Thompson Park, visitors can rent snowshoes and cross country skis on snowy days from Dec. 15 through Mar. 19. Thompson Park’s Cross Country Skiing Trails are groomed when conditions are favorable. Marked un-groomed trails are also available at Clayton Park, Hartshorne Woods Park, Holmdel Park, Huber Woods Park, Shark River Park, Tatum Park, and Turkey Swamp Park. To ice skate on ponds, look for "Skating Today" signs at Holmdel, Shark River and Turkey Swamp Parks. It normally takes a week to 10 days of subfreezing temperatures to produce safe skating conditions. When the ice is considered safe, skating hours are from 8 a.m.-7 p.m. Sunday-Thursday and from 8 a.m.-9 p.m. Friday and Saturday. When conditions are safe visitors can experience ice fishing at Manasquan Reservoir Thompson Park and Turkey Swamp Park. Ask a park ranger about designated ice fishing areas and times in each park. From plastic dishware to wrapping paper, the holiday season can mean lots of waste. Try to reduce unnecessary waste and remember to properly dispose of your trash. The Monmouth County Resident's Recycling Guide has information on what can be recycled, how to sort materials and how to dispose of hazardous items. Wrapping paper is recyclable along with wine and champagne bottles. However, many items should not be recycled. Throw metallic coated wrapping paper in the trash along with cardboard or paper soiled with food, including paper plates and cups. If you're looking to turn on your little one's toy and you realize you need to throw away old batteries, note that A, AA, AAA, C, D and 9-volt batteries can be thrown in the trash. If a party guest breaks your favorite plate or drinking glass dispose of it in the regular trash, as these glasses are not recyclable. No matter what your holiday season brings, remember to properly recycle! 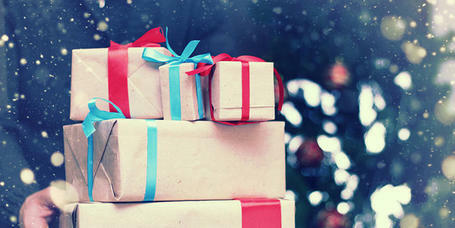 The Monmouth County Environmental Council Wishes You a Safe and Happy Holiday Season! The purpose of the newsletter is to inform Monmouth County citizens on the health of their environment and list environmental outreach events in their community. The newsletter is produced by the Monmouth County Division of Planning Section of Environmental & Sustainability Planning in coordination with the Monmouth County Environmental Council. The County of Monmouth and the Board of Chosen Freeholders do not necessarily share the viewpoints of any environmental group mentioned in this newsletter.